State policies that advance “economic development,” broadly defined, boil down to government support for businesses through subsidies. These usually take the form of preferential tax treatment, such as select tax credits, or direct grants of taxpayer money to specific firms or industries. There is broad consensus among academic economists that these programs are wasteful at best and actively damaging to a state’s economy at worst. In addition, they encourage cronyism and corruption by creating high stakes for the winners and losers of such policies. States engage in these programs to varying degrees of extravagance. A New York Times series of articles compiled a comprehensive accounting of many of these state-based corporate welfare programs in 2012. Though somewhat dated, no such comprehensive accounting has since occurred and there is little reason to believe that much has changed. The Times’ ranking, however, is flawed by the fact that states differ in terms of how they account for these subsidies — some are more transparent than others. As a result, some states may underreport how much corporate welfare they engage in compared to other states with more comprehensive transparency requirements. In addition, the New York Times included some tax provisions that should not be classified as corporate subsidies. This study applies the logic of public choice economic reasoning to not just the corporate welfare programs themselves but to the political environment in which decisions are made. 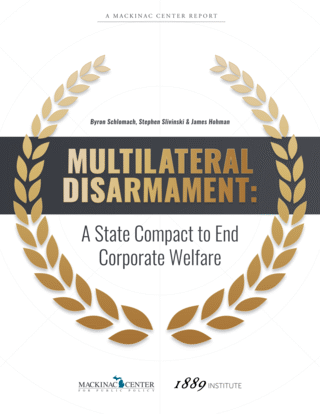 In so doing, it makes the case for a comprehensive, national solution to break the cycle of unhealthy subsidy competition between states: a “cease fire” or multilateral disarmament agreement — i.e., an interstate compact between states that could finally create momentum toward good forms of tax competition and away from the subsidy-heavy ones. The appendix of this study includes a model compact — the first of its kind — that could be adopted by states.